I’m always interested in exploring the true human elements of change management. I regularly have the conversation with others whereby I explain that change is more than a process it’s a journey of feelings and experience. This emotional side is far too easily overlooked, particularly by those managers who want to manage activity rather than the people doing it! In the past year or so I’ve been taking a keen interest in discussions around the personal, or human emotional bank account. This is based on the premise that every individual has a set level of emotional energy within themselves and every time they do something, part of this energy is used up. However, there is only a finite amount of energy, so over time it may become dangerously low or even be exhausted. When this happens, people fall sick, become depressed or withdraw from interaction with others, even having a breakdown in the most extreme cases. As with a financial bank account, when the funds are perilously low, things get scary. To prevent going too low on your emotional account, you need to find ways to make deposits into it. Like in the financial space those deposits can be achieved from a wide range of sources, and will vary in amounts too. Now we live in a world that doesn’t create a lot of space to get deposits of emotional energy. Most of the emotional withdrawals are linked to change events, with the extreme changes having greatest impact. Of course, one of my personal challenges is allowing people time to recover somewhat from a change before the next comes along. We never have opportunities to truly grieve on the last change, before the next happens. Now the whole concept of an emotional bank account I find close to building personal and therefore professional resilience. I talked about this in my last post here. 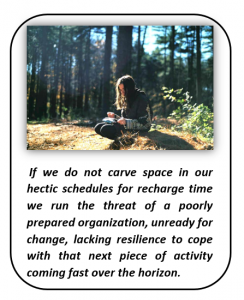 If we do not carve space in our hectic schedules for recharge time we run the threat of a poorly prepared organization, unready for change, lacking resilience to cope with that next piece of activity coming fast over the horizon. I think there are a number of easy things we can do to help with building up the balance in this emotional bank account. We can start by recognizing its existence and reflecting on our personal levels. We can find ways to recognize what takes more out than others and prepare for those higher value withdrawals. We can also find ways to newly create or replenish those emotional reserves. To this latter point I have seen a personal change in my levels since embracing elements of mindfulness. I’m not an expert in the field by any stretch, but the short time outs to consider self and be centred around your position in the universe have truly paid me dividends. This article I wrote discussed my journey with mindfulness. I truly see great benefits in managing your emotional bank account, developing resilience and being better prepared for professional and personal change in your life. We live in a constantly changing world with an ever increasing speed of change and number of changes. We need to find our coping mechanisms proactively and move away from Band-Aids to try and fix it when its too late!